Honey Stinger™ (Honey, Sea Salt, Water), Almonds, Crisped Rice (Sugar, Salt, Malt), Honey Stinger™ Fruit Smoothie Blend (Blueberries, Apple Juice, Sunflower Oil), Yogurt Coating [Sugar, Palm Kernel Oil, Yogurt Powder (Cultured Whey Protein Concentrate, Cultured Skim Milk, And Yogurt Culture), Non-Fat Dry Milk Solids, Soya Lecithin (An Emulsifier), Soy Protein Isolate, Vitamins & Minerals: [Dicalcium Phosphate, Magnesium Oxide, Ascorbic Acid (Vit C), Cholecalciferol (Vit D), Alpha-Tocopherol Acetate (Vit E), Biotin, Zinc Oxide, Niacin, Ferrous Fumarate (Iron), Molybdenum Glycinate, Calcium Pantothenate, Copper, Manganese, Beta Carotene (Vit A), Selenium, Pyridoxine (B6), Riboflavin (B2), Thiamine (B1), Chromium, Cyanocobalamin (B12), Folic Acid, Potassium Iodine]., Rolled Oats, Natural Flavor. Honey Stinger™ (Honey, Sea Salt, Water), Peanuts, Crisped Rice (Sugar, Salt, Malt), Rice Flour, Coating [Sugar, Vegetable Oil (Fractionated Palm Kernel Oil), Cocoa Powder, Whole Milk, Natural Flavor, Soya Lecithin (An Emulsifier), Salt], Rolled Whole Oats, Vitamins & Minerals: [Dicalcium Phosphate, Magnesium Oxide, Ascorbic Acid (Vit C), Cholecalciferol (Vit D), Alpha-Tocopherol Acetate (Vit E), Biotin, Zinc Oxide, Niacin, Ferrous Fumarate (Iron), Molybdenum Glycinate, Calcium Pantothenate, Copper, Manganese, Beta Carotene (Vit A), Selenium, Pyridoxine (B6), Riboflavin (B2), Thiamine (B1), Chromium, Cyanocobalamin (B12), Folic Acid, Potassium Iodine], Natural Flavors. Honey Stinger™ (Honey, Sea Salt, Water), Crisped Rice (Sugar, Salt, Malt), Almonds, Coating [Sugar, Vegetable Oil (Fractionated Palm Kernel Oil), Cocoa Powder, Whole Milk, Natural Flavor, Soya Lecithin (an emulsifier), Salt)], Semi Sweet Chocolate Chips [Sugar, Chocolate, Cocoa Butter, Milk Fat, Soya Lecithin (an emulsifier)], Rolled Oats, Soy Protein Isolate, Vitamins & Minerals: [Dicalcium Phosphate, Magnesium Oxide, Ascorbic Acid (Vit C), Cholecalciferol (Vit D), Alpha-Tocopherol Acetate (Vit E), Biotin, Zinc Oxide, Niacin, Ferrous Fumarate (Iron), Molybdenum Glycinate, Calcium Pantothenate, Copper, Manganese, Beta Carotene (Vit A), Selenium, Pyridoxine (B6), Riboflavin (B2), Thiamine (B1), Chromium, Cyanocobalamin (B12), Folic Acid, Potassium Iodine], Cocoa Powder. Not your ordinary energy bar! Truly a great-tasting meal replacement snack or after workout recovery bar. 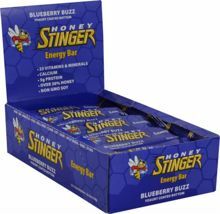 Honey Stinger protein bars are all natural and contain no trans fats. Our energy bar is truly unique as we include over 30% USDA certified organic honey, 5 grams of protein from non GMO soy – almost 10% of the daily recommended allowance, 22 vitamins and minerals, calcium and antioxidants.